Former Prince George's County Executive Wayne Curry may be losing weight due to his battle with cancer, but in a conversation with News4's Jim Vance, it was clear he's far from losing his faith -- and wit. Curry -- though he was born in Brooklyn, NY -- has spent the vast majority of his life in Prince George's County. Curry and his brother were two of the first African Americans to attend Cheverly-Tuxedo Elementary School and he has stayed in Maryland since. 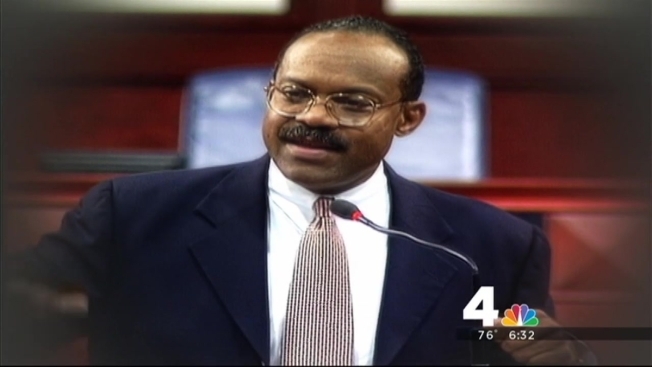 In 1994, he became the county's first African American county executive, where he stayed until 2002. He brought unprecedented change to Prince George's County -- a 150 percent increase in home sales, significant expansion of business development, a 68 percent drop in police misconduct -- though he remains modest about it all to this day. "I was much more interested in making sense than making history," Curry said. Last August, he was diagnosed with lung cancer. "When the diagnosis was rendered, the doctor asked me, 'Is there anything I can do for you?' I said, 'Sure, you can give me five minutes.'" And despite the fact he's lost 50 pounds during his battle, he's far from losing his faith. "I prayed, consulted with God, I managed myself because I had to present my kids with the appropriate imagery with the challenge that beset me. The really compelling thing is that I wasn’t scared," Curry explained. Curry's quick thinking and wit showed quickly in his interview with News4's Jim Vance, when Vance asked him a few rapid-fire sports questions. "Terps. They went to the Big 10. Good move, bad move?" Vance asked. "Wizards. They rehired their coach. Good move, bad move?" "Miami Heat, San Antonio Spurs... who are you liking?" "Spurs. You gotta love the grown-ups." "Final question ..." Vance begins asking. "Yes. Change it," Curry quickly replies, referencing the controversy surrounding the Washington Redskins' name. With this clever, down-to-earth demeanor, Curry seems to have accepted what his diagnosis could mean, and wants to create change -- the kind he has already made in Prince George's County for decades. “My focus now is to identify and publicize the great disparities of treatment of cancers in America because African Americans are beset by lung cancer more than any other people, and lung cancer is the most ferocious cancer of them all. “I just want to remind people that there’s another doctor on duty. And that one’s not controlled by any of this," he said.